Many of us have seen in the news about the political and social unrest in other countries resulting in people being displaced due to persecution or fear for their lives. It can be overwhelming when we see that kind of need and feel like it’s a world away. Often we’re just unsure of how we can help…but did you know that many of these refugees live right here in our community? 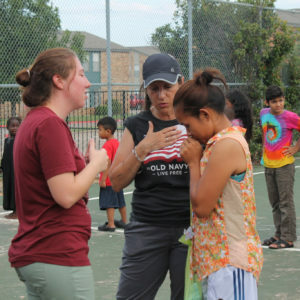 Last week Milestone Missions sent out our Fort Worth Refugee Mission team to serve the many refugees that have settled in our area. Our team visited and brought gifts to 60 refugee families in their homes, hosted cooking classes and a pastor’s gathering, as well as provided sports ministry for kids. The trip culminated in a Welcome to America festival where over 400 refugees heard the message of the gospel. 19 people gave their lives to Christ, including the son of a Hindu priest. One of our Milestone members, Shaina Pickering, went on this trip praying that God would allow her to use her unique gift to serve others. “I’ve been coming to Milestone for about 3 and a half years, and I am an American Sign Language Interpreter for the Deaf. 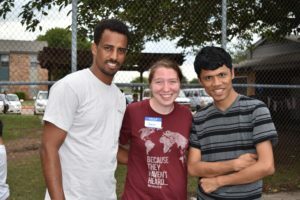 I have worked alongside the Deaf for about two years now, but never would I have even thought that my work life and my church life would mix as they did on this trip! When I signed up for the Fort Worth mission trip this summer, something was telling me I was able to use my gift for His glory in the spiritual family He placed me in. My prayer was to simply meet a Deaf refugee while on this trip and be given an opportunity to minister on this trip using the language, skill, and gift that God has given me. On our first day there, the schedule changed. We were supposed to leave the complex by 6, but instead we came back to the complex at 6 to do more ministry. This change of events wasn’t planned by us, but God knew exactly what He was doing because at 6:30, in the same clubhouse we were in, there was an American Sign Language class being held for the Deaf refugees who were living there. While we were still getting ready to go out and do ministry, 14 of the kindest, most welcoming people I have ever met came in to get ready for their class. And all I had to do was stand there and say, “Lord, I’m willing.” It amazed me. I invited everyone to come to the festival knowing that I would be interpreting for the Deaf. I made friends, I felt like I belonged, I interpreted prayers, and I was able to talk about Jesus in my second language, which was really cool! I can’t wait to go back and see where these connections lead and how I am able to connect even further with the Deaf community. Shaina, we are so proud of you and the rest of the missions team for serving God so faithfully. What a great reminder that God can use any gift when we offer it to Him. Way to go Shaina! So proud of you. Love this.